The T-mobile G1 by HTC was the first Android phone launched in the market. Things have changed much in the last two years. More than 10 companies are now making Android phones and around 200000 devices are activated per day. The T-mobile G2 announced today- is the second phone in the series which is a good upgrade from the existing model. The G2 is the first phone on T-mobile USA network with HSPA+, that is up-to 4G connectivity. Like its predecessor, T-mobile G2 also has the full QWERTY keypad. The screen is wider with the implementation of an optical trackpad. 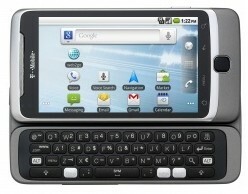 T-Mobile G2 will be shipped with latest Android 2.2 Froyo mobile operating system and will have the original Android interface. The overall design of the T-mobile G2 is much better than G1. It was not easy to open up the QWERTY keypad in the old design. The buttons were removed and replaced with an optical trackpad. There was a bend or tilt at the bottom near chin, for the G1 that later became a trend in a series of Android mobile phones. The first round of photos from T-mobile USA shows that the new version doesn’t have that bend. The QWERTY keypad in T-mobile G2, along with the Swype software enable better tying on both physical as well as virtual keyboards. T-mobile G2 has a 3.7 inch capacitive touch screen with multi-touch input and accelerometer support. There is inbuilt 4GB flash memory and 8GB MicroSD card in the package, further expandable up-top 32GB using external card slot. Another important facility in G2 is the 5MP camera with HD 720p) video recording. Wi-Fi, Bluetooth with A2DP, A-GPS, Google Voice, Navigation, Google apps, 1300 mAh battery, 800MHZ processor, are other notable features of the device. T-mobile G2 will be available for pre-order – by the end of this month on the official website. The expected price of G2 with a contact is $199 and $500 without one.